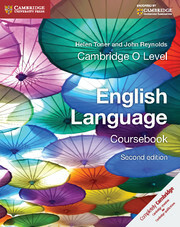 Cambridge O Level English Second Edition has been written for students preparing for Cambridge O Level in English Language, conducted by Cambridge International Examinations. Written in a clear and accessible style, the book offers comprehensive coverage as per the revised syllabus. Updated and designed for class use as well as independent study, the book helps prepare the students for the examination.